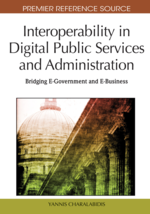 There is a growing awareness that the interoperability among Government Agencies’ information systems (IS) is of critical importance for the development of e-government and the improvement of government efficiency and effectiveness. However, most of the IS interoperability research and practice in government has been focused on the operational level, aiming mainly to enable the delivery of integrated electronic services involving several Government Agencies, or to support the co-operation among Government Agencies from the same or even different countries. This chapter is dealing with knowledge-level interoperability, aiming to support higher knowledge-intensive tasks of government, such as the formulation of legislation and public policy. In particular, it presents an ontology-based methodology for achieving knowledge interoperability of IS of Parliaments and Government Agencies, so that they can exchange public policy related knowledge produced in the various stages of the legislation process. It is based on the common use by Parliaments of the ontology of the ‘Issue-Based Information Systems’ (IBIS) framework for constructing representations of this knowledge. An application of the proposed methodology is presented, followed by an evaluation, which results in an enrichment of the above ontology that enables a better representation of the public policy related knowledge produced in the legislation process, providing a ‘higher quality’ of knowledge interoperability. Finally a generalization of this methodology is formulated, which can be used for achieving knowledge interoperability among IS of other types of Government Agencies. to enable cross-border operational collaboration between Government Agencies of different countries, e.g. for the enforcement of European Union regulation and policies, or the delivery of pan-European e-government services by its member states. On the contrary, there has been much less research and practice concerning the ‘knowledge-level’ interoperability among IS of Government Agencies, even though the capability to share not only data, but also knowledge as well, has been recognized as a major objective of the IS interoperability concept, as shown by its abovementioned definition provided in the European Interoperability Framework (European Commission, 2004). Government Agencies realize more and more the need of systematically managing, exploiting and exchanging their knowledge, as a means of formulating better policies and regulations for addressing social needs and problems, delivering better services to citizens and enterprises and finally achieving higher efficiency and effectiveness (Wiig, 2002; Sourouni et al, 2008). For this purpose it is necessary that Government Agencies use more intensively and strategically methods and practices from the knowledge management domain (e.g. Nonaka, 1994; Nonaka & Takeuchi, 1995; Cohendet & Steinmueller, 2000, Tiwana, 2002) with appropriate technological support. In particular, it is important through appropriate ICT to support and facilitate both at the intra-organizational and the inter-organizational level the four basic knowledge creation and exploitation processes proposed by Nonaka and Takeuchi (1995): knowledge externalization, combination, internalization and socialization. This requires higher levels of knowledge-level interoperability between the IS of different Government Agencies, allowing them to exchange not only data but also knowledge as well. In the same direction the model of interoperability maturity levels in digital government proposed by Gottschalk (2007) suggests that the initial levels of ‘computer interoperability’ (level 1) and ‘process interoperability’ (process 2) should be followed by ‘knowledge interoperability’ (level 3), which is necessary for proceeding to the higher levels of ‘value interoperability’ (level 4) and ‘goals interoperability’ (level 5).